Gokulam Kerala FC proved to be much stronger today for the young Shillong Lajong FC as they muscled their way to win their third home game 3-1. The game was being played at the EMS Corporation Stadium, Kozhikode. Gani Nigam, Antonio German and Rajesh S scored for Gokulam Kerala FC while Buam was the lone scorer for Shillong Lajong FC. Gani Nigam was adjudged the Hero of the Match. Gokulam Kerala FC went on the offence from the first minute. Their first effort to score happened in the third minute when Suhair V.P. made a fine cross from the left but before German could find the space to head it, Lajong FC’s Aiban made a fine diving interception to clear the ball out of danger. 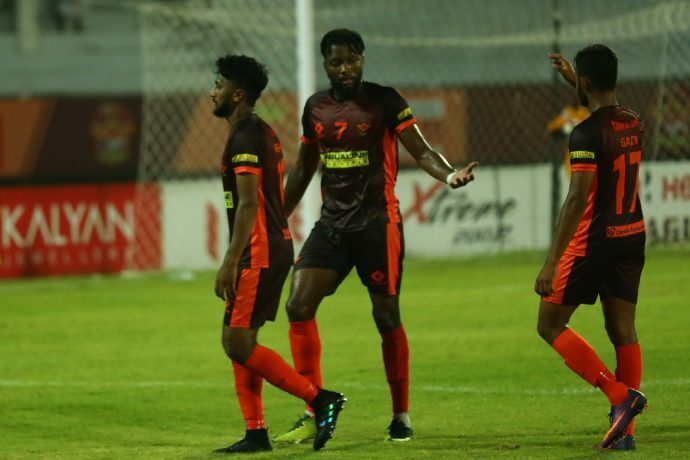 Both the teams were playing attacking football, however, it was Gokulam Kerala FC who created chances more often to land in a strong scoring position. Shillong Lajong FC looked more organized all throughout with a fantastic defence line and an equally agile goalkeeper in Neithovilie who blocked and cleared all scoring opportunities for Gokulam Kerala FC. Lajong FC’s forward line also played an impressive game in the first half making some dangerous attempts but failed to convert any thanks to some fine saves from Gokulam Kerala FC’s Shibinraj. A foul in the 42nd minute from Shillong Lajong FC’s Novin on Gokulam Kerala FC’s Brazilian midfielder Castro ended up in a free-kick for the hosts. A minute later when Castro took this free kick from outside the box, Gani Ahmed made no mistakes in collecting the ball and finding the back of the net giving Gokulam Kerala FC a much-deserved lead in the game. The second half began with the hosts kick-starting the attack but their attempts were duly foiled by the Lajong FC defenders, but not for long. In the 56th minute, Antonio German found the back of the net for Gokulam Kerala FC to give them a comfortable two-goal lead in the game. Gokulam Kerala FC, thereafter, shifted gears with most of the game happening in Lajong FC’s half. The young Lajong FC defenders were kept busy by Gokulam Kerala FC forwards when a brilliant cross from Gani Ahmed in the 66th minute inside the box saw Rajesh find the back of the net through a flying kick. With this goal, the scoreboard read 3-0 in favour of the hosts. Shillong Lajong FC, who are the only all-Indian team apart from Indian Arrows in the 12th I-League, played beautiful football even after a three-goal deficit and finally, their efforts paid off in the 78th minute, when Phrangki Buam scored an excellent goal from a clever pass from Sheen just outside the box. In the dying minutes of the game, Shillong Lajong FC would have pumped in another goal but failed to convert the same from just in front of the Gokulam Kerala FC’s goal. A second yellow card for Lajong FC’s Novin Gurung in the 94 minutes saw the young defender walk out of the pitch. The game came to an end with Gokulam Kerala FC defeating Shillong Lajong FC 3-1.